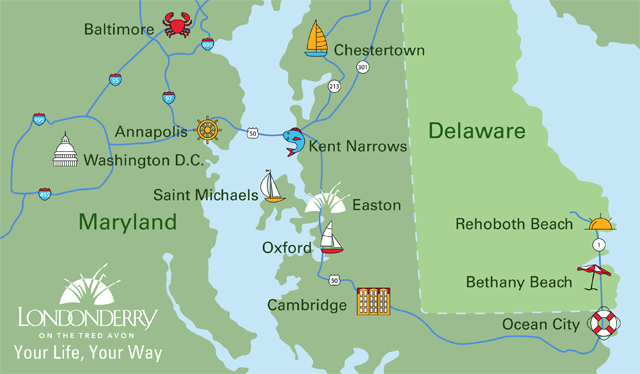 Londonderry on the Tred Avon is located in Easton, Maryland on Maryland’s Eastern Shore. The community is located off MD Rt. 322 and Port Street in Easton. The entrance to Londonderry is the first entrance on the left on Port Street after crossing or turning off of Rt. 322. Follow the signs at the Guard House and drive straight ahead to the Community Center. Visitor parking is available to the right. Our address is 700 Port Street, Suite 148, Easton, MD 21601. Why are you here the visitor asked as he looked me straight in the eye. I was taken aback for a moment but this occasion I had to reply. To begin I answered “just looking around” Do you see all the cottages, built strong and sound? The community Center is the hub and the heart. That goes a while back to Londonderry’s start. From the 1700’s, now that is a plus. Cross over the by-pass as go further down and you will be in the heart of a wonderful town . You will have most everything your heart could desire. Living here you won’t be alone to sit home by the fire. The Arts are well concentrated Theater, Music, Painting and crafts. And history buffs can visit the past. Rachel and Kristina can give you all rest.